I gave this book a well-deserved 4.5 stars. 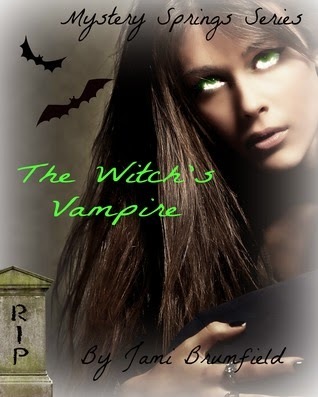 It is a superb story, giving vampire romance a new slant and I can see an intriguing series in the making. Sophie Waters is a twenty-one year old medical student who is following her dream of becoming a doctor and going into research, but all was put on hold when her mother was diagnosed with cancer and became extremely ill. Sophie came home to care for her and a heart breaking year later, her mother succumbed to the disease. Reeling from the shock of her death her father told her something that turned her world and everything she knew upside down, she was a witch by birth. Her mother had bound her powers so that she could have a normal human life as much as possible but now that had to end and that she had to give up her dreams of going away to study and to stay in Mystery Springs and to take over from her mother and become their witch doctor. Realizing that she had been lied to all her life, angry and upset she leaves the house and finds herself at the local nightclub which is run by a vampire. Giovanni Mancuso an over a century old vampire is the owner of the club and considered royalty in the vampire world happens to spot Sophie and feels drawn to her. She intrigued him this green-eyed vixen. Trying to make his way over to her, he sees her being dragged out of the club by a stranger to his club and follows to see if he could be of any help to Sophie. After confronting the man who happens to be a Nephilim, an enemy of the vampire world, he finds out that he is asking Sophie for help in healing his sister. Deciding that they all go back to Sophie's house to discuss this more it was here that Sophie and Giovanni start to explore the feelings that they have found that they shared for each other. They found that they only had to touch each other and tingles run through both of them. Finding themselves alone Giovanni admits to Sophie that he was only hanging around because she piques his interest and wants to find out more about her. As he takes her hand he kisses it gently and gives out a laugh. "I’m not going to bite you, Sophie Waters, unless you want me to?" Sophie felt her world spin out of control with the things he was saying to her. "You smell amazing…and taste wonderful." He whispered, his voice deeper, raspier. His hand shook as he tried desperately to keep his wits about him. He moved the shaky hand from her chin to the side of her neck and she leaned into his hand, exposing more of her tender neck. Desire consumed both of them. He could smell it rising from her, and feel it in every fibre of his being. He scraped his teeth against her skin, but forced down the urge to puncture. It took every ounce of his willpower to keep him from sinking his teeth into her flesh and drinking the tiniest bit of her blood. "What are you doing to me?" she asked barely above a whisper. "I have a feeling what is happening here is two sided, no?" This attraction they felt between them could not be denied. But nothing comes easy for them. Threats surround them bringing danger to both of them. A brilliant first book to hopefully a great new series. Will certainly be following this one closely.